Weddings are more than "colors" and "themes." Weddings are a communion, a reverent celebration, a story, (your love story!) and an experience for not only you, but for your family and friends to savor and remember for a lifetime. The fact that this was Brittany's sensibility when she met with me for the first time told me everything I needed to know and offered me the perfect charge! She and Barret had been on what I call the "wedding circuit." So many of their friends and peers are getting married and it seemed as if they were going to a wedding every other month! Through these weddings she and Barret attended, she had seen, heard and tasted what seemed to be everything, and she wanted hers and Barret's wedding to be signature, just like them! *wink. First things first; starting the day relaxed and confident is the perfect approach to experiencing all of the beautiful moments that are ahead of you as the day unfolds. 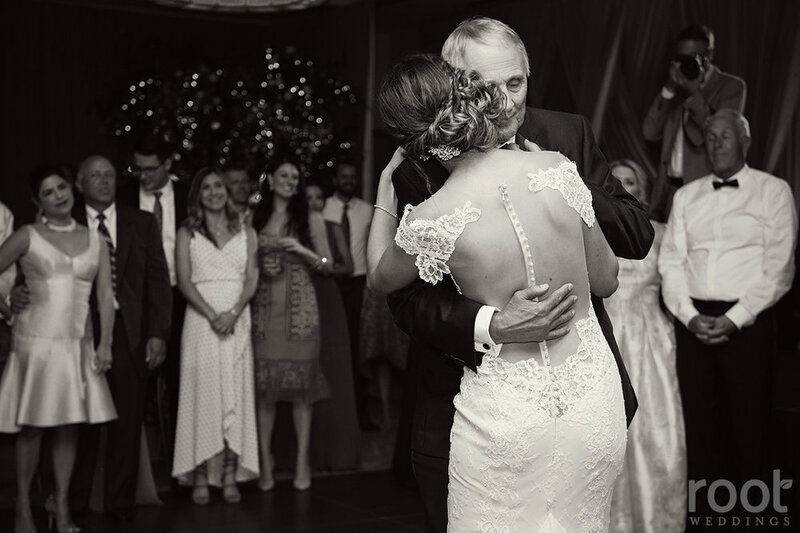 This space here is to give you ample warning (and time to grab some tissues!) as to quite possibly the most emotional Daddy reveal I have ever seen. Now tell me these are not images that will turn into forever mementos! Recovered yet? Shall I give you a moment? Here's a sweet Bridesmaids reveal as you gain your composure! 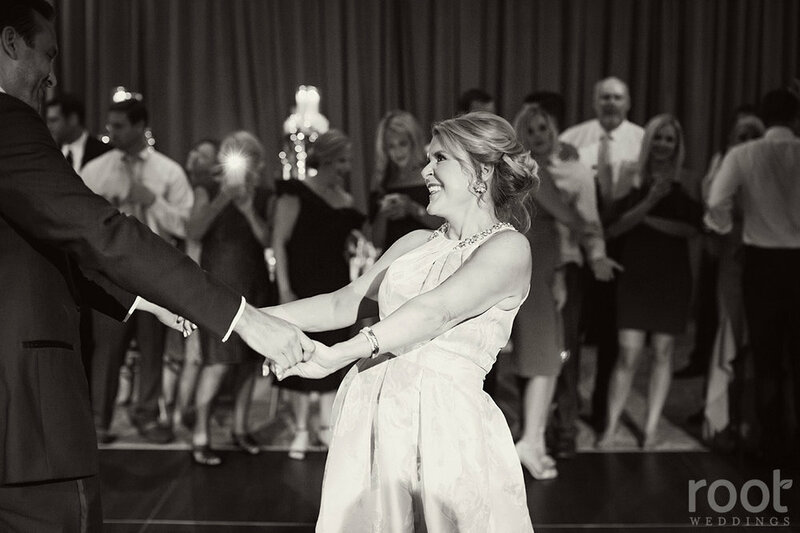 How about a stunning look at Brittany's processional, a sharp wedding party and some portraits of Brittany and Barret to look at while you take care of that pesky thing in your eye... *wink! Brittany's white, lush and romantic bouquet consisted of white garden roses peonies and, my favorite, ranunculus (seriously, I try to sneak them in every wedding that I am able!) against light touches of greenery. The trailing ribbons were soft, feminine and I loved how the bouquet moved with her in that striking Ines DiSanto gown. 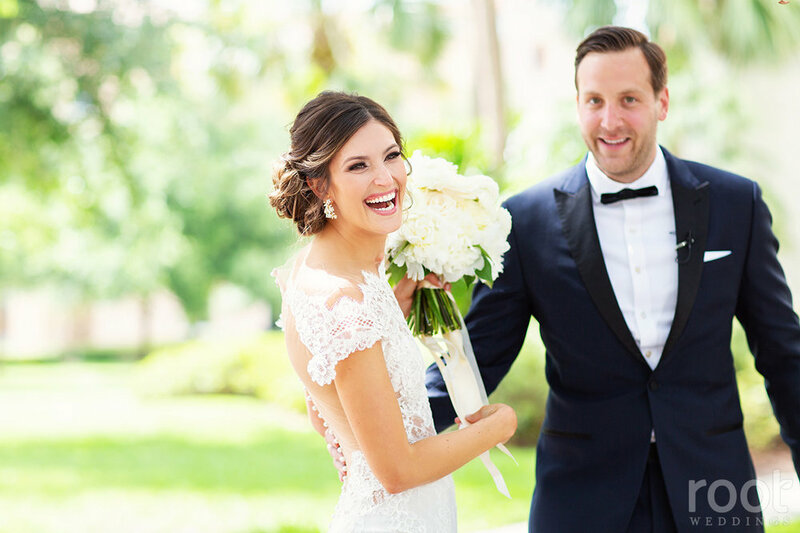 I love that these portraits here are the perfect transition from the garden aesthetic from just outside Knowles Chapel to what we created inside the ballroom at The Alfond Inn! So what sets this wedding apart from the others? Cue the details! Designing a wedding reception in a ballroom needs particular attention to details that offer those 4 walls life. We opted for these tall centerpieces with cascading greenery and candles on top to offer a romantic and dreamy glow as guests dined. I loved how the seating directory turned out thanks to Andi Mejia Calligraphy! This wedding cake was very well deserving of it's very own backdrop! I had four custom trellis panels constructed where vines and greenery were interwoven throughout with touches of white florals creating a 10-12 foot canopy over our bars and cake. It was magical! First Dance, Daddy-Daughter Dance, Mother-Son Dance; give me alllll the dances!! Brittany and Barret, this is one I shall never soon forget! Your confidence and trust made my "job" so worthwhile, and I loved watching this beautiful day unfold for you! Valentine's Day | A Day Inspired By Love!